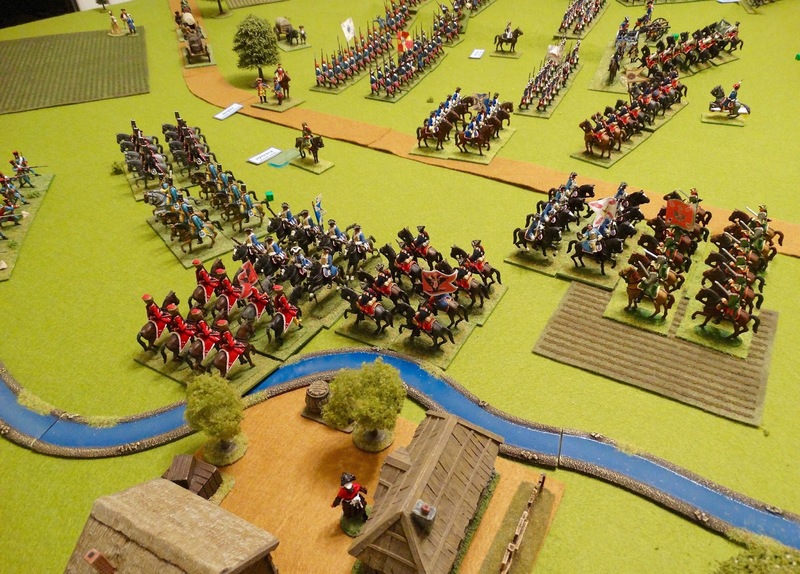 Many players of Honours of War have contributed battle reports and scenarios to the HoW website. Personally, I don't recall a bad one amongst them and I have gained much enjoyment and inspiration from reading about these battles and checking out the photos. Perhaps one name does stand out, a gamer with the username damnitz. 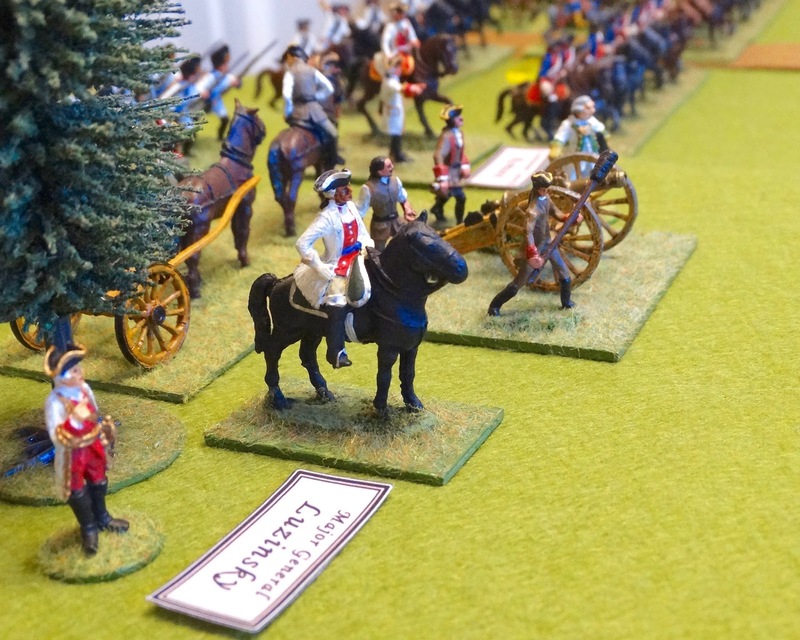 Damnitz uses historical battles, particularly from the War of the Austrian Succession, to inspire many of his own scenarios, but also has a knack for fictional situations. I have often promised myself the pleasure of using one of his ideas for a game of my own, and recently got the chance. I selected his recreation of The Battle of Pfaffenhofen from 1745, where an Allied army of around 7,000 French, Hessians and units from the Palatinate faced an Austrian army of about 10,000. The scenario developed by damnitz recreates the situation after Pfaffenhofen itself had fallen to the Austrians, leaving the Allies attempting to form a defensive position to the west of the town. I updated the setting from 1745 to 1761, with the Prussians defending and the Austrians attacking. This would be a 'tactical withdrawal' situation, where the Prussians were attempting to escape from an Austrian trap. The situation is shown on the map below, courtesy of damnitz himself. Austrians in white, Prussians (originally France & Allies) in black. The original scenario featured a large proportion of small sized units with a good number of them being inferior class, to represent the units actually present at the battle. I used full sized units, as well as a smaller table (6' x 5' rather than 8' x 6'), so my battle field was rather more cramped than damnitz intended. I found that adjusting some of the formations (such as placing the right wing Austrians in column) did the trick. Below is my version of the scenario. 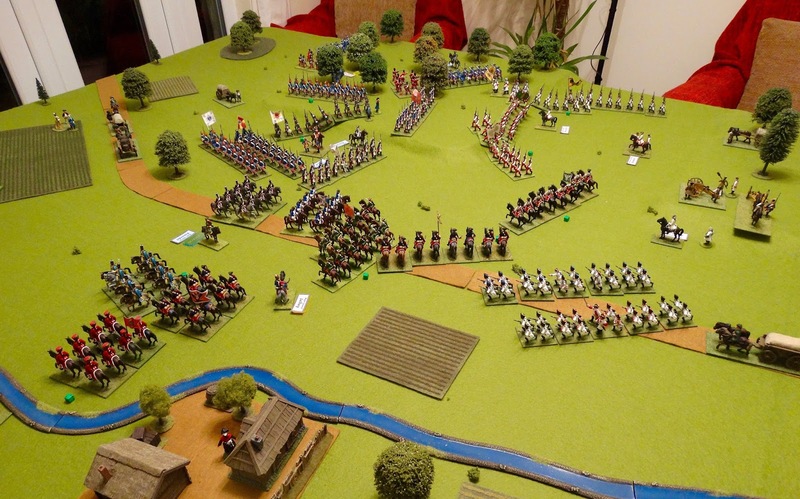 Overnight, a Prussian force has taken up a defensive position between some wooded high ground and a stream. Unfortunately, their scouts have let them down and during the hours of darkness the Austrian force opposing them has managed to infiltrate light forces around both their flanks. Now the Prussians must extricate themselves from the trap. The nature of the ground behind them means their units must exit the area along the line of the road that leads off the battlefield to the west. 14 units, ABP = 7. The Austrians are the designated attackers. The Prussian force takes time to absorb its new orders and cannot move on move 1, except to react to Austrian actions (e.g. turn to face, evade, retreat etc.). Each Prussian unit exiting the table via point ‘A’ counts as 1 point if it has 0-3 hits, or ½ a point if it has 4 hits. 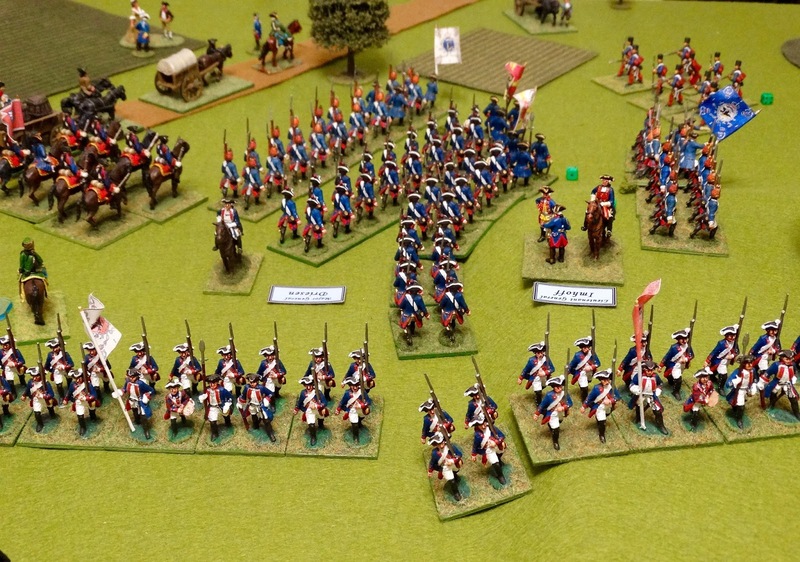 The Prussians must exit 8 points worth of troops through ‘A’ to win. Units must exit the table on the road or up to 15cm north or south of it. As usual, if either side reaches its Army Break Point before the end of the game it has lost. 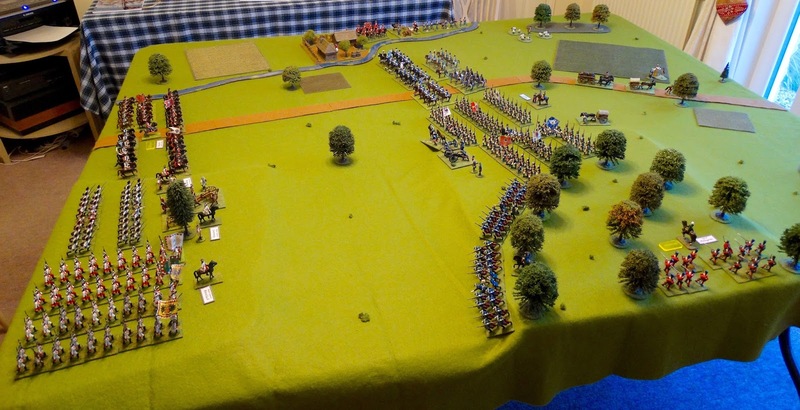 The set-up, looking south with Austrians on the left and Prussians to the right. The Prussians. 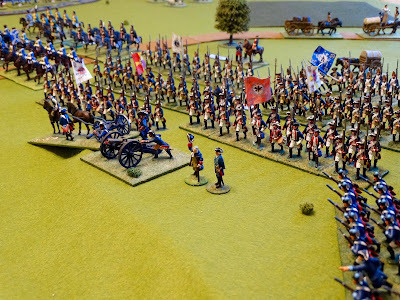 General Imhoff (background) and his main body of infantry. Major General Luzinsky commanded the right-hand brigade of Austrian infantry. The rather spindly artillery man behind him is an old Spencer Smith figure. fell on the rear of the Prussian Freikorps. Similarly, the dashing Austrian cavalry commander also double moved. 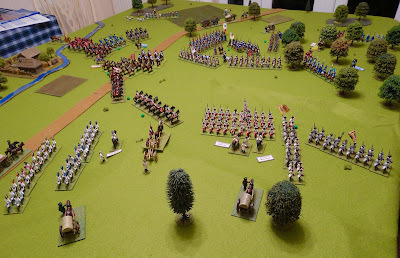 As the Prussian hussars turned to face the approaching Austrian light infantry, the Austrian cavalry fell on the remainder of the now outnumbered Prussian horse. 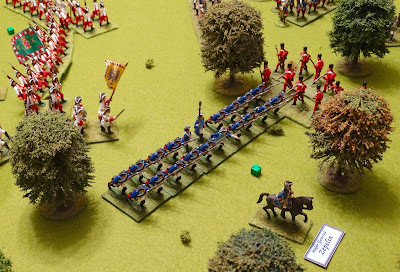 The Austrian hussars from the flanking legion also plunged in. 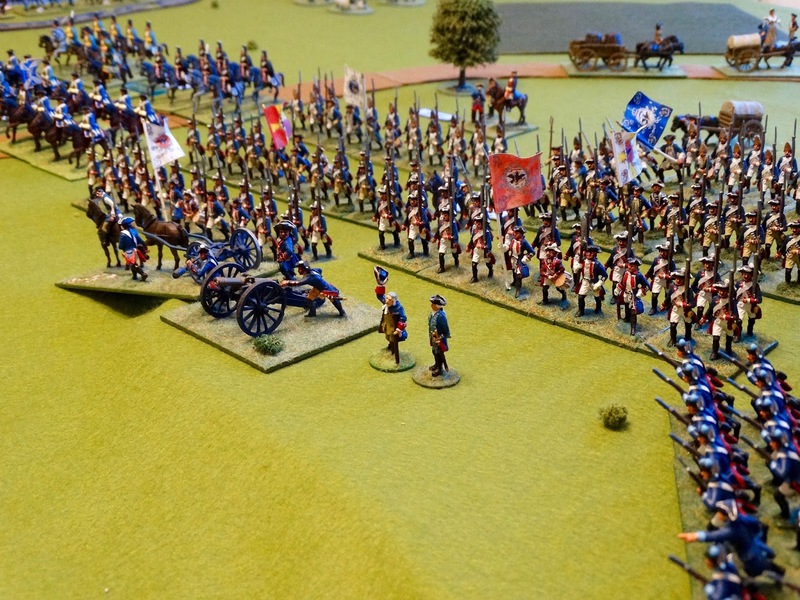 In the right background the Austrian cuirassiers fall on the Prussian guns. Overview on the next move. The Freikorps are panicking and one unit has already scattered through the woods (background, top right). The other is under pressure to flank and rear. Units of the Prussian centre are filtering back to their baseline but things are proceeding at rather too stately a pace. General Imhoff watches as his second and third line form up and move west. Next move, and the remaining Freikorps unit is about to crack under the pressure. The Prussians have lost 3 out of their 5 cavalry units in a punishing melee (foreground left). 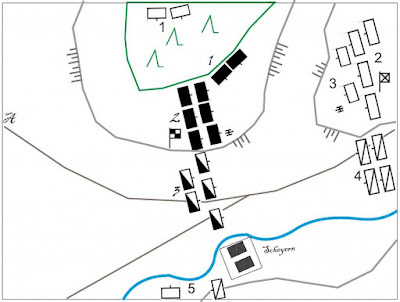 The Austrian cuirassiers have scattered the isolated Austrian gun battery to the four winds. 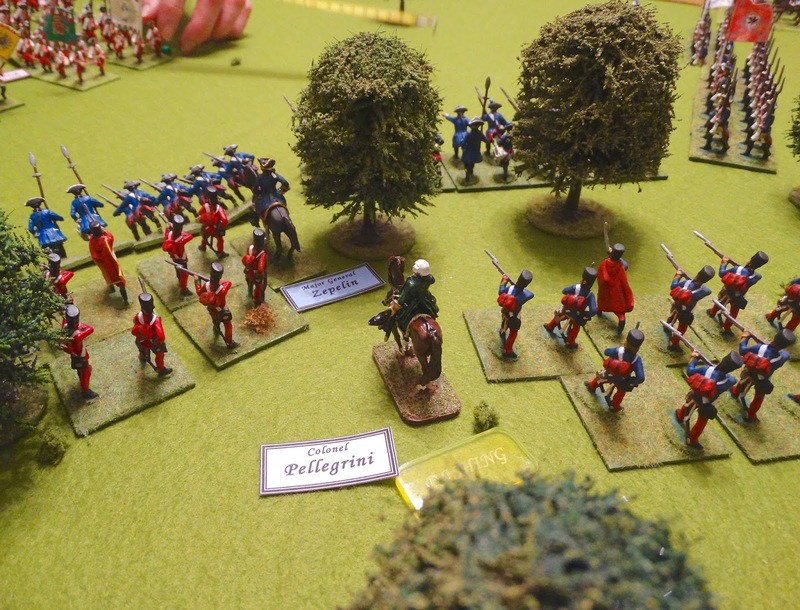 The Austrian grenadiers hasten forward in column to reinforce the success on the Austrian left. Behind you! 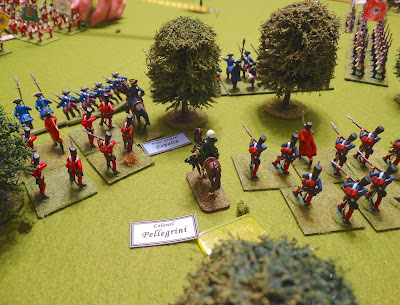 The Prussians are moving back, but not quickly enough to avoid the lively Austrian attack. (the last remaining Freikorps unit) was about to rout off the Prussian baseline (outside the allowed exit 'gate'). 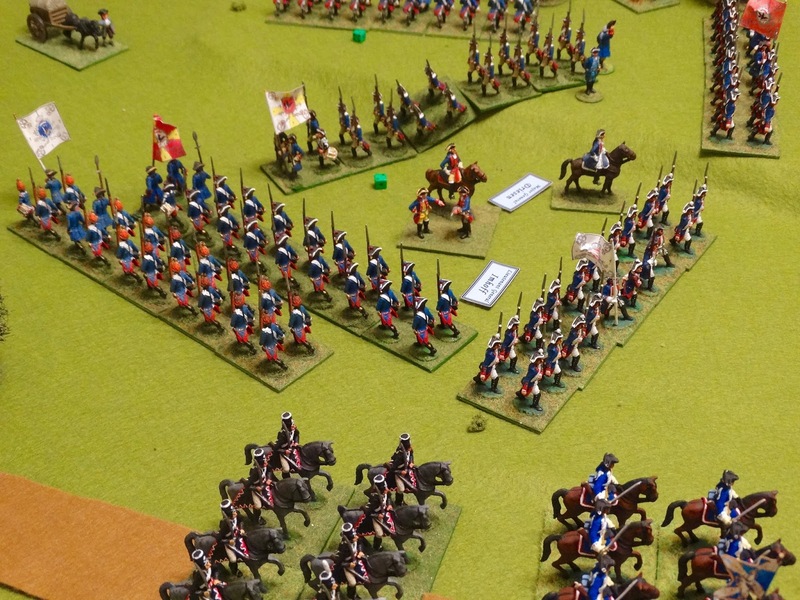 The Prussian force would break in move 6. This had been an all-action 2 hours of wargaming, with heavy casualties and a number of flank and rear assault situations testing out the rules. Predictably, the only addition I had made to the scenario conditions (one move's delay before the Prussians could react) turned out to be unnecessary. 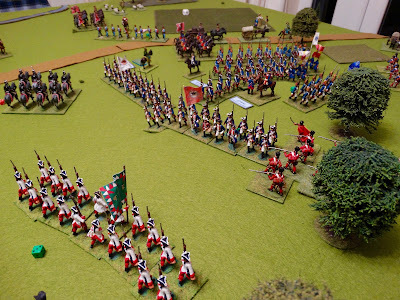 I will definitely play out this scenario again without that condition, which will give the Prussians more chance of a clean break. An excellent evening's wargaming was had by both players. Thanks for coming over Paul. Another update on Ancients progress coming up soon. See you then. Great game and I agree that 'Damnitz' does come up with some great scenarios. Looking forward to the Ancients update. Not sure if I missed it, but what figures are you using? Those look brilliant! Thank you Keith. I am currently making an order with Richard at RSM.